Day’s Cottage Apple Juice is made with apples from traditional, mature orchards in Gloucestershire. The fruit comes only from unsprayed orchards and dozens of varieties are used, some unique to the county, such as Taynton Codlin, Flower of the West and Underleaves. These give flavours unobtainable from modern commercial fruit, and can be enjoyed as unusual single varieties or as carefully blended juices. No additives or preservatives are used and the juice of over 1kg of fresh fruit fills each 75cl bottle. No sprays, chemicals or artificial fertilisers are used in our orchards, thus preserving their rich and varied wildlife. Our traditional ciders and perry are fermented and matured in oak barrels. Once again, only old varieties are used, including Morgan Sweet and Foxwhelp apples and Brown Bess and Blakeney Red pears. Day’s Cottage Apple Juice is a family run business, based on the family farm, and reviving a long tradition of cider and perry making in Gloucestershire. 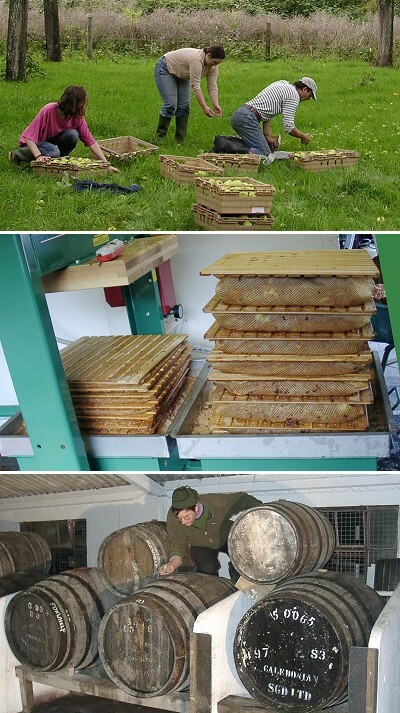 In previous generations every farm had its orchards, and most had their stone cider presses; we have merely brought these traditional methods up to date and are making totally pure juice, ciders and perry, the only process being that of pasteurisation. What makes our apple juice so special? 100% local – all our fruit is grown in Gloucestershire, minimising food miles and giving a taste from our landscape. Keep it local! Wildlife orchards – large trees growing in flora rich pasture grazed by sheep. Plants, insects, birds all thrive together. Conservation – conserving and replacing traditional orchards and helping to save old Gloucestershire varieties. Day's Cottage, Upton Lane, Brookthorpe, Gloucestershire, GL4 0UT.